Introducing: The VENUE DISPLAY REPORT! Mobile Sports Report is pleased to announce our latest editorial endeavor, the VENUE DISPLAY REPORT! A new vertical-specific offering of MSR’s existing STADIUM TECH REPORT series, the VENUE DISPLAY REPORT series will focus on telling the stories of successful venue display technology deployments and the business opportunities these deployments enable. No registration or email address required — just click on the image below and start reading! 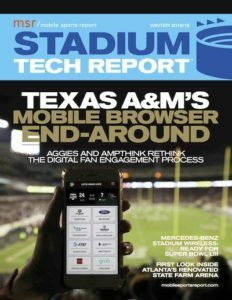 Like its sibling Stadium Tech Report series, the Venue Display Report series will offer valuable information about cutting-edge deployments that venue owners and operators can use to inform their own plans for advanced digital-display strategies. Our reporting and analysis will be similar to that found in our popular STR series, with stadium and venue visits to see the display technology in action, and interviews and analysis with thought leaders to help readers better inform their upcoming technology purchasing decisions. And in case you are new to the MSR world, rest assured that all our VDR reports will be editorially objective, done in the old-school way of real reporting. We do not accept paid content and do not pick profiles based on any sponsorship or advertising arrangements. Our inaugural issue contains profiles of a new concourse display strategy at the San Jose Sharks’ SAP Center, powered by new LED screens from Daktronics and the Cisco Vision IPTV digital display management system; a look at the Utah Jazz’s decision to use Samsung’s system-on-a-chip displays at Vivint Smart Home Arena; and the San Francisco 49ers’ decision to use Cisco Vision to control displays at Levi’s Stadium. Start reading the first issue now! No download or registration necessary. As venues seek to improve fan engagement and increase sponsor activation, display technology offers powerful new ways to improve the in-stadium fan experience. While these topics are of prime interest to many of our long-term audience of stadium tech professionals, we suggest that you share the link with colleagues on the marketing and advertising sales side of the house, as they will likely find great interest in the ROI enabled by strategic display system deployments. Sponsorship spots are currently available for future VDR series reports; please contact Paul at kaps at mobilesportsreport.com for media kit information. 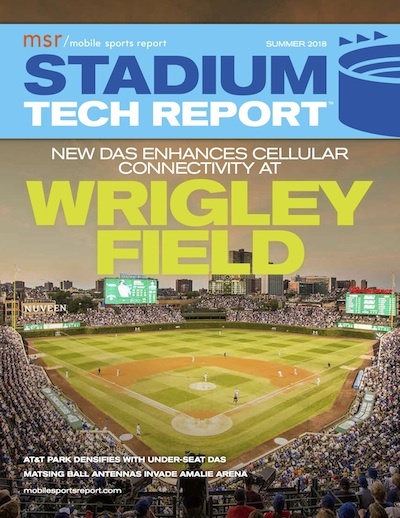 Call it the ‘Connect the DAS’ issue — our latest STADIUM TECH REPORT is heavy on DAS news, with new deployments at Wrigley Field, AT&T Park, and Amalie Arena — all of them breaking news, as in you heard it here first! At AT&T Park, the home of the San Francisco Giants, there is a brand new upgrade to the stadium’s DAS network, an AT&T-only deployment of DAS antennas inside the same under-seat enclosures used for stadium Wi-Fi. An experiment at first, just a few months into the season it has surprised both the team and the carrier with how well it’s doing. Get the details by DOWNLOADING OUR FREE REPORT right now! Second at bat in the news-scoop arena is another DAS deployment, this one just getting underway at Amalie Arena in Tampa, home of the NHL’s Lightning. The twist on this new network — also being installed by AT&T — is that it will exclusively use MatSing ball antennas, those quirky-looking “big ball” antennas that you may have seen used in a temporary fashion at outdoor events. What’s bringing them inside? DOWNLOAD THE REPORT and read our exclusive story! 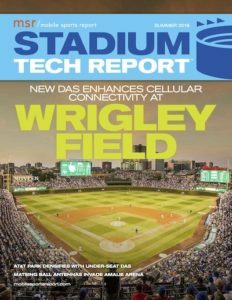 And at venerable Wrigley Field — the friendly confines of the Chicago Cubs — a long-planned upgrade to the venue’s cellular systems is finally in place, using JMA Wireless equipment deployed by DAS Group Professionals. Our in-person visit took a look at how DGP and the Cubs merged new technology with one of baseball’s most historic structures. Who says DAS is dead? In addition to those stories we also have a complete, in-person visit and profile of the new networks at the newest stadium in MLS, the Los Angeles Football Club’s Banc of California Stadium. We also have a Q&A with Sprint CTO Dr. John Saw, all packed into one issue ready for FREE DOWNLOAD right now! We’d like to thank our sponsors for this issue, which includes Mobilitie, Corning, Huber+Suhner, JMA Wireless, Cox Business/Hospitality Network, Oberon, Boingo, MatSing, ExteNet and DAS Group Professionals — without their support, we wouldn’t be able to make all this great content available to you for no cost. 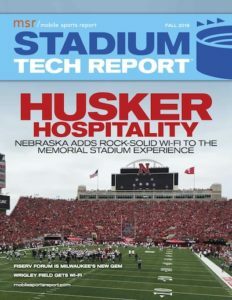 Thanks for your interest and we hope you enjoy the latest issue of our STADIUM TECH REPORT series! New Report: Wi-Fi scores at Final Four, Vegas Knights get more Wi-Fi, and more! 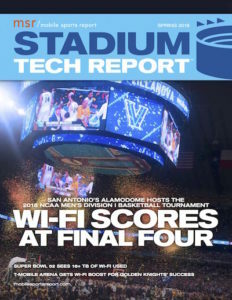 A live in-person report of the Wi-Fi network performance at this year’s Final Four is just the beginning of our latest STADIUM TECH REPORT, the ONLY in-depth publication created specifically for the stadium technology professional and the stadium technology marketplace. Mobile Sports Report traveled this spring to San Antonio, Texas, to get a firsthand look at the new networks installed at the venerable Alamodome, including one new permanent Wi-Fi deployment and another specifically tailored for the temporary courtside seats the NCAA brings in for its crown jewel event of the men’s basketball season. Download our free report to get the details on how this network was able to deliver a superb wireless experience to the almost 70,000 fans in attendance. The report from San Antonio, however, is just the beginning of our content-rich Spring 2018 issue, which also contains another in-person review, this one of the updated Wi-Fi network at T-Mobile Arena, the home-ice castle for the NHL’s newest sensation, the Vegas Golden Knights. Prompted by the team’s somewhat unexpected on-ice success, the quick network upgrade is a great lesson on how to respond to fan-experience demands. And it’s all explained in the STADIUM TECH REPORT. There’s also a profile of the new network that was part of the refurbishment of Minneapolis’ Target Center, home of the NBA’s Timberwolves, as well as a look at some innovative marketing programs combining digital signage and Wi-Fi for greater fan engagement. 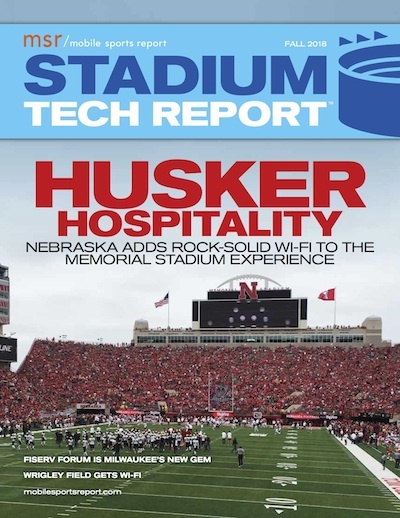 Our Terry Sweeney also provides a look at new venue construction and old venue remodels in Los Angeles, and we also have a full recap of the record-breaking Wi-Fi and DAS traffic at this year’s Super Bowl at U.S. Bank Stadium in Minneapolis — all available for free download from our site! We’d like to take a quick moment to thank our sponsors, which for this issue include Mobilitie, JMA Wireless, Corning, Huber+Suhner, Cox Business, Boingo, Oberon and Aruba, a Hewlett Packard Enterprise company. Their generous sponsorship makes it possible for us to offer this content free of charge to our readers.